Bright Angel, originally uploaded by The Bacher Family. 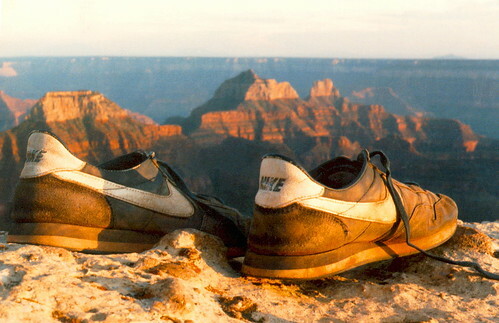 I took this picture in 1986, on one of my final days working as a guest room attendant and National Park Service volunteer on the south rim of the Grand Canyon. I had two days at the end of my season before flying home... so hiked down to Phantom Ranch after my last day of work, up to the North Rim the next day, and all the way back across the canyon on my last day. These are the shoes I wore. I was 19, and too poor to buy good hiking boots! I shot this photo at Bright Angel Point at sunset.